That’s not the typical response to a neighbor who says she can’t imagine what a woman who lost her husband is going through… but then again, Netflix’s upcoming series "Dead to Me" isn’t your typical show about losing a loved one. Netflix just released the trailer for "Dead to Me", and I don’t know whether to laugh or cry after watching it. This dark comedy stars Christina Applegate and Linda Cardellini and explores the sad reality of life after losing a significant other. Don’t let this depressing theme steer you away, because telling from the trailer, this show is going to balance out the sadness with its hilarious characters. Jen, played by Applegate, recently lost her husband to a hit-and-run incident. It's when she attends a support group for grief that she meets her soon-to-be bestie, Judy, played by Cardellini, who has also lost her fiancé very suddenly. But there seems to be more to Judy’s story. Despite the warnings Jen is receiving about Judy -- including the cops showing up at her door looking for her and Judy being called a “criminal” -- Jen decides to stick it out with her friend because she is the only one who can truly understand her situation and who has been there for her. Jen’s tough exterior and sarcastic tone melds well with Judy’s quirky yet vulnerable personality to create a hilarious duo that will fix the sad with funny. The trailer starts with the first quote I mentioned earlier and ends with Jen breaking her hardened shell for a moment and talking to the bird her son thinks is his dad, only to have the bird fly away. Those are just a few examples of the comical flare added to the somber moments that come along with grief. I think this show is going to be very interesting to watch because it is such a different take on such a real situation. 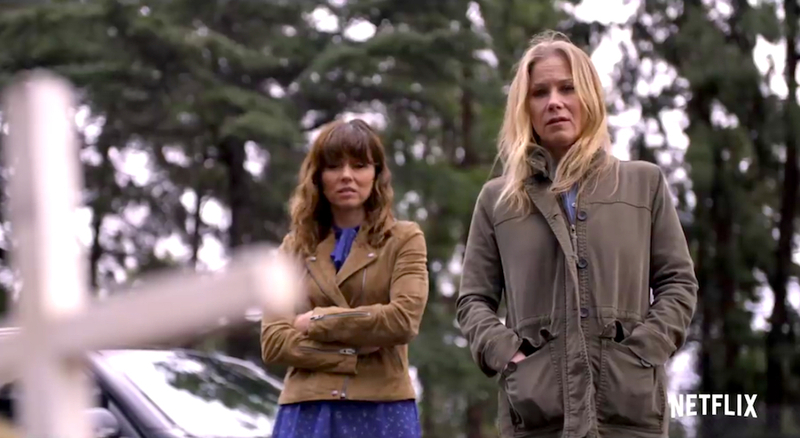 Be prepared to ugly-cry sooner than later, because "Dead to Me" launches May 3!